Rain gutters and downspouts can capture and direct rainfall away from buildings to protect them from damage. When buying gutters choose the thickest metal available and look for primary or new materials. Recycled materials are inconsistent in thickness and may contain dissovable non-potable substances. Collecting rainwater also involves protecting your gutters from leaves, bird dropping and any other organic material. If you would like a more in depth knowledge on gutters,how to design them,install and maintain them,I strongly suggest you visit Rain-gutter guide. Everything you want to know about rain gutters in much more detail. 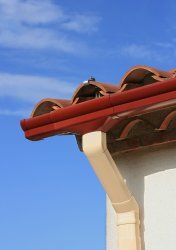 Various types of gutters exist on the market. It always depends on your budget and the quality you would like to have installed. Vinyl gutters or plastic ones are prone to damage by maintenance equipment such as ladders, but are resistant to rust and rot. Vinyl gutters will have a tendency to break under extreme hot or cold weather. The most common type of gutter you will find in residential homes are steel gutters and aluminum ones. Galvanized steel gutters are the most economical if your on a budget and are stronger than aluminum gutters but somewhere down the line they may rust. As the saying goes, we keep the best for last, but not least. Stainless steel gutters are the most expensive, but are also the strongest, will remain rust-free and maintain a high shine for years. No matter what type of gutters you use, they should all be attached to downspouts via drop outlets and if your going to replace gutters, go for a seamless or continuous gutter. Join two sections of a gutter together will have a tendency to create a leak.